Today we held another community cookout at Toni Furman’s house. The last one was a smash hit with the neighborhood. Since then neighbors have been pouring forth sharing their housing justice struggles and joining in the movement! Organizing in Toni’s neighborhood has been exciting. Each time another community member shares their struggle publically others feel inspired to do the same. Toni’s crisis and courage has drawn together her neighborhood in a way it’s never been before. People who didn’t know each other at all or very well have formed life long bonds over the last month. It’s been a real privilege to be a park of this exciting process. Cenlar, the mortgage company that wrongly foreclosed on Toni has refused to open any line of communication with her community despite many attempts. Please sign Toni's online petition. Warehouse Lofts tenant Jaye Crawford's lease ends on Sunday, June 30. 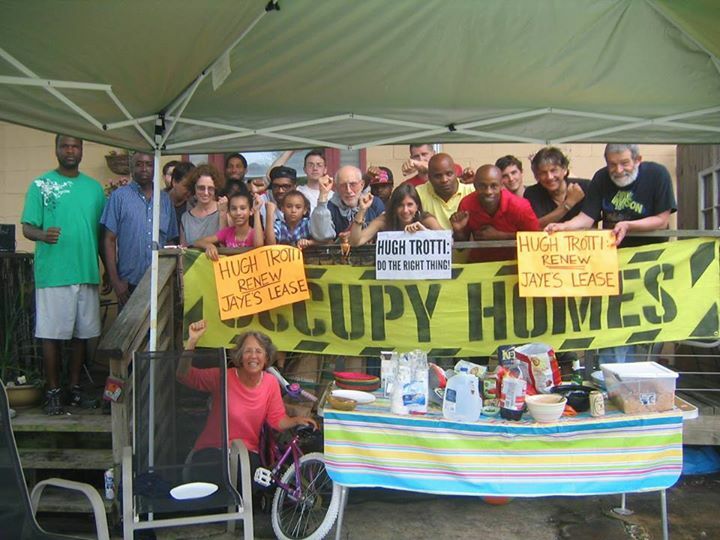 Even with a three month Occupy Our Homes Atlanta campaign, Warehouse Lofts owner Henry Finkbeiner and manager Hugh Trotti are still refusing to renew Jaye's lease. They have refused numerous requests to meet with a number of organizations that volunteered to mediate a peaceable solution including American Friends Service Committee, and Rainbow PUSH. 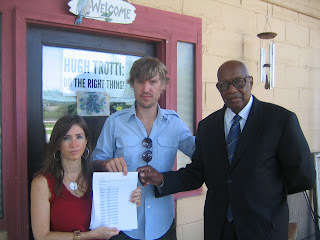 Both times Hugh Trotti and Henry Finkneiner refused not only to meet, but also to simply provide a reason they plan to push Jaye out of her home of almost 15 years. Just because Jaye spoke up about her neighbor's noise violations, the Warehouse team wants to evict her and her daughter. This past Friday, we decided to visit Warehouse Lofts owner Henry Finkbeiner's home. We hope to show The Warehouse Lofts owner Henry Finkbeiner and his property manager Hugh Trotti that the community will not sit back while he moves to displace a single mom, Jaye Crawford, and her daughter. We continue to hope that Warehouse Lofts will change their minds and move to do the right thing, but if they don’t, we will continue to organize around Jaye’s campaign for justice. We will not allow abusive land lords to go unchecked in our community. McCalla Raymer Law Firm Wins Family Displacement Award!! 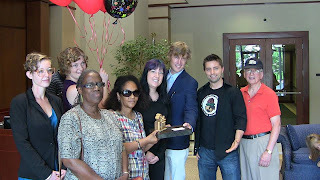 Occupy Our Homes Atlanta and American Friends Service Committee showed up unscheduled at the law firm of McCalla Raymer today to present them with the prestigious Family Displacement Award! McCalla Raymer has been instrumental in assisting banks in their effort to steal wealth from hard working Georgia residents. McCallaRaymer has excelled at putting people out of their homes and into the street. Today we congratulated McCalla Raymer for going the extra mile to swiftly remove people from their homes so that banks can claim massive inventories of vacant homes, collect insurance, and then sell homes to private equity firms at record rates. McCalla Raymer also played a key role in the robo-signing scandal. In fact many fraudulent robo-signed signatures were signed by McCalla Raymer personnel. Robo signing may not have been possible without the tenacity of McCalla Raymer. 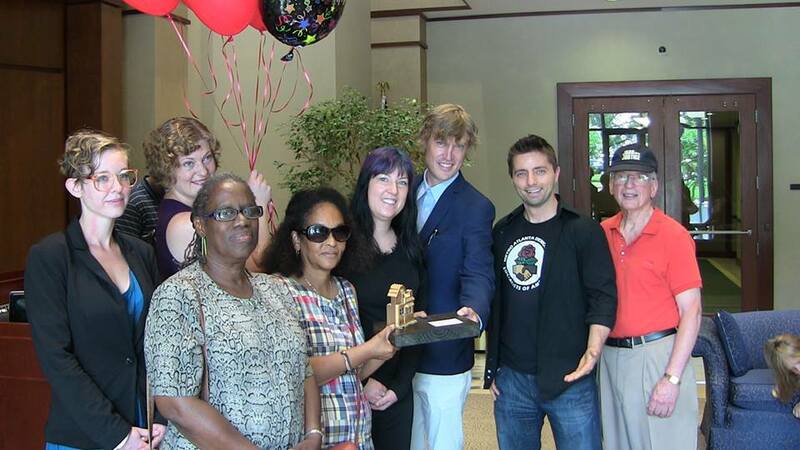 Several homeowners with first-hand experience with MacCalla Raymer's zeal for home theft were on hand to present the prestigious award, including Toni Furman who was wrongly foreclosed on and evicted May 7th of this year. 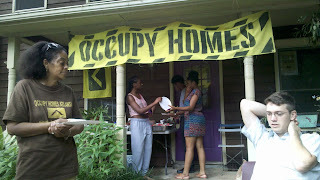 Here at Occupy Our Homes Atlanta we believe in celebrating other’s hard work and determination. Few law firms have worked harder to ruin lives than McCalla Raymer has, and they certainly have profited greatly as a result! Congrats! Being number #1 at anything is no small feat. Huge Victory For Parkwood Farms!! Parkwood Farms Therapy Center reached out to Occupy Our Homes Atlanta last November on the same day that Gwinnett County sheriff's deputies were attempting to enforce an eviction. 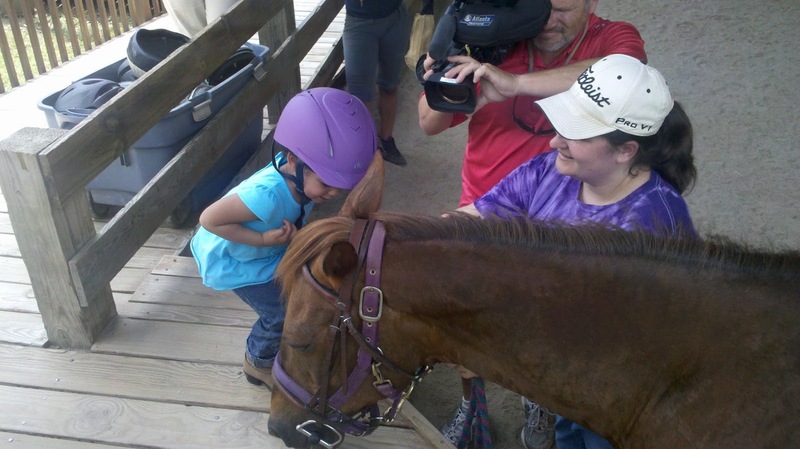 When the economic crisis hit in 2008 some of the children who receive the very unique therapy that Parkwood Farms could no longer afford the fees Parkwood Farms asks for. Parkwood Farms made the decision to put people over profit and work with those that needed their services. Around the same time their monthly payments shot up dramatically. Doctor Marilyn Peterson immediately began working with the bank on a loan modification. Dr. Peterson faced the same struggle that millions of Americans faced, having to resend modification packets, broken promises from the lender, and eventually a refusal to work with her. After holding multiple heartfelt press conferences attended by parents, children, volunteers, and all of Snellville's City Council the bank decided to negotiate. It took organizing candlelight vigils on the farm, holding protests at the bank law firm’s office, launching multiple online petitions, and raising a lot of money before a final deal was struck. Today around 1pm Dr. Marilyn Peterson, who runs the therapy center and is a mother of a child with a disability, closed on a deal that will keep the open for the children that need it. "After all this time since November, we can declare that I own this property outright.This is a great day," Peterson said. American Friends Service Committee is excited to have been able to play a key role in this meaningful effort and is elated that the Farm will be open and safe for children living with disabilities for years to come! Together we can speak truth to power and win! Today I met with Jaye and her friend(who's a local landlord as well) Nina Roark to discuss next steps to keep her landlord, Hugh Trotti, from moving forward with evicting Jaye and her young daughter from the place they have called home for almost 15 years. So far Jaye has requested a meeting with Hugh Trotti, I have respectfully requested a meeting with Hugh Trotti, which he refused. 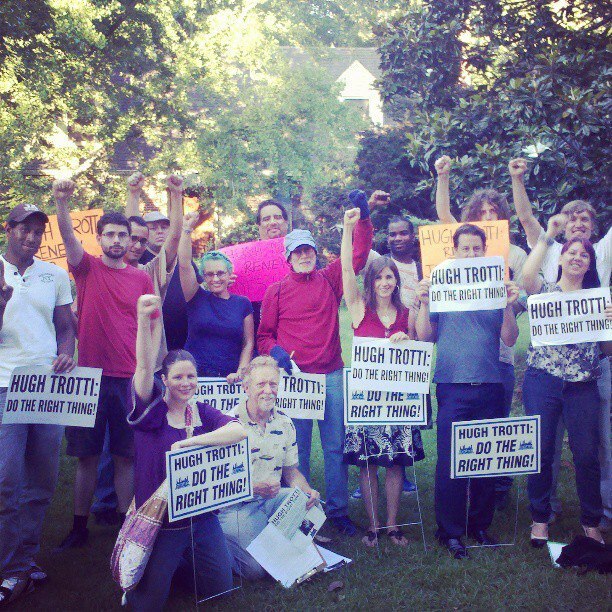 After his refusal we had a few hundred people call and request a meeting with Hugh Trotti, there have been two candle light vigils in front of the Trotti residence, the Trotti's community was canvassed by a few dozen people all urging Hugh Trotti to work with Jaye. 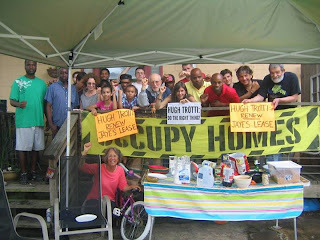 There has been an online petition for Jaye launched, a very large eviction free cookout at Jaye's home, and even professional yard signs encouraging Hugh Trotti to do the right thing. Moving forward there has been plans made to continue to organize a candlelight vigils in front of the landlords home, and picket the future investment properties currently being built by the same owner. Despite all of this Hugh Trotti has refused to speak with Jaye or even explain why he wants to evict Jaye and her daughter. Today it became clear that the kind of energy being put into this campaign is unprecedented for this type of fight. We decided to simply attempt to have a conversation with Warehouse Lofts management and try to present them with Jaye's rent a few days early. Management refused the money and did not commit to sit down and talk. We left our number and asked them to call us in the next few hours, they never did. 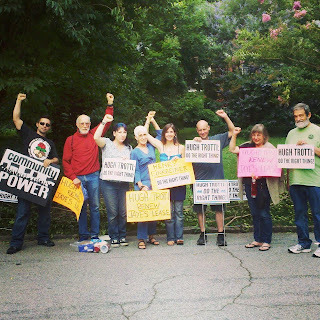 Today Occupy Our Homes Atlanta and American Friends Service Committee held a candlelight vigil in front of Warehouse Lofts landlord Hugh Trotti’s home in Decatur. There was a number of current and former tenants on hand to call out Mr. Trotti’s troubling pattern of evicting tenants whenever legitimate complaints are lodged. There was also several Atlanta landlords speaking out against abusive practices. 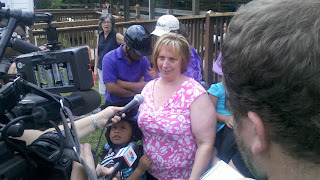 Most recently Mr. Trotti has moved forward with putting single mother Jaye Crawford out of her home of almost 15 years. 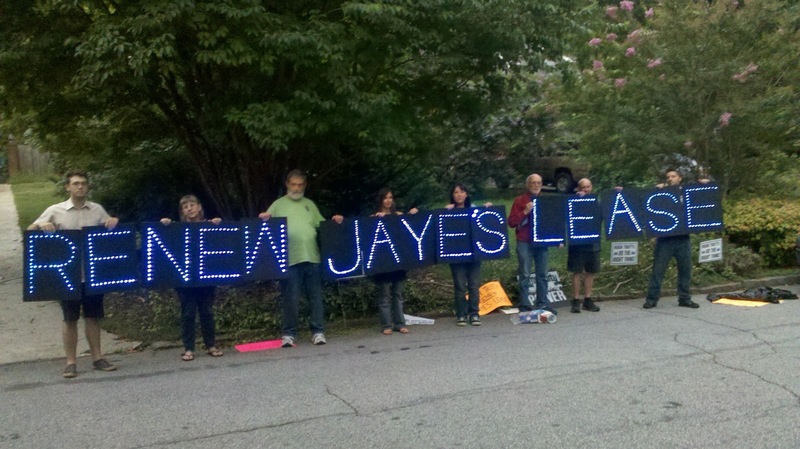 Jaye has been told by her landlord that her lease ending June 30 will not be renewed. She has lived in her zoned-commercial unit for 14 years, which serves as both a living and work space for her personal training studio. 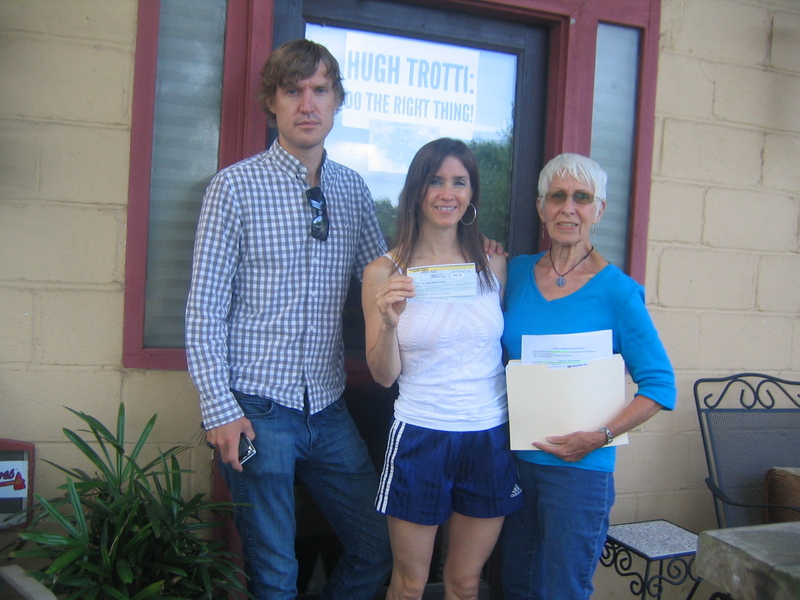 When Jaye took a neighbor to court over incessant noise violations (and WON) Hugh Trotti refused to renew her lease. Mr. Trotti’s stated reason: “No one reason in particular.” Mr. Trotti has yet to address the law-breaking tenants, and has refused numerous requests for a sit-down meeting resolving this problem. 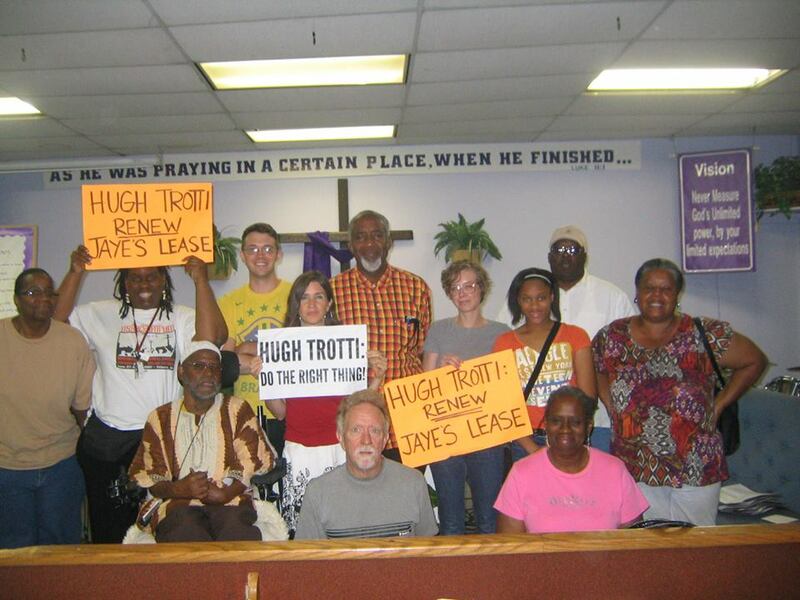 We want Hugh Trotti to renew Jaye’s lease, immediately. Should she be forced to move, she will lose her business, and her straight A student daughter may be forced to change schools. Jaye and her daughter deserve to stay in the place they call home. 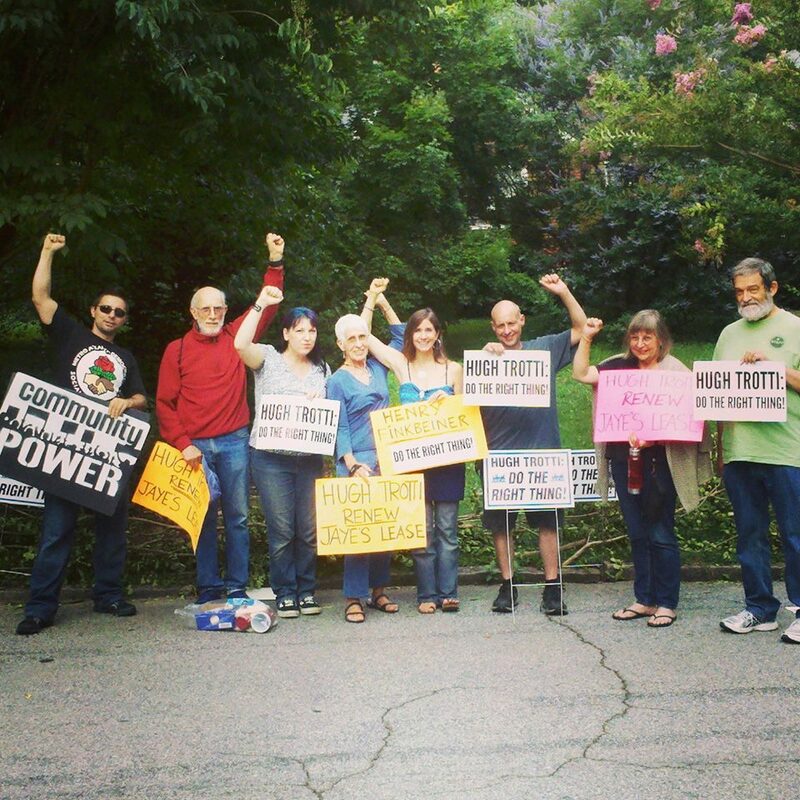 In addition to the candlelight vigil, community members canvassed Mr. Trotti’s neighborhood so that his community knows how he treats his tenant. Yard signs were set out around the neighborhood that read, “Hugh Trotti, do the right thing!" 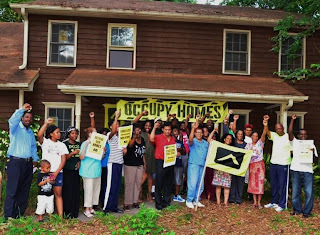 Occupy Our Homes Atlanta continues to get calls and emails from tenants under the thumb of abusive landlords. Today we want to make it clear to Atlanta landlords that abusive practices will not be tolerated. Please sign and share Jayes online petition. Today a delegation of six people hand delivered the petition to keep Jaye Crawford and her young daughter from being evicted from a place she had called home for over a decade. The petition was delivered to Hugh Trotti who manages the property and has has made it clear that it's his call to displace Jaye and her daughter. 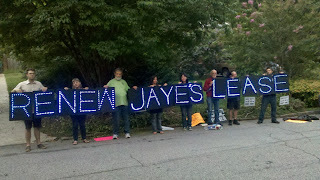 Up to this point Mr. Trotti has refused to meet with Jaye to review why his is unwilling to renew her lease. 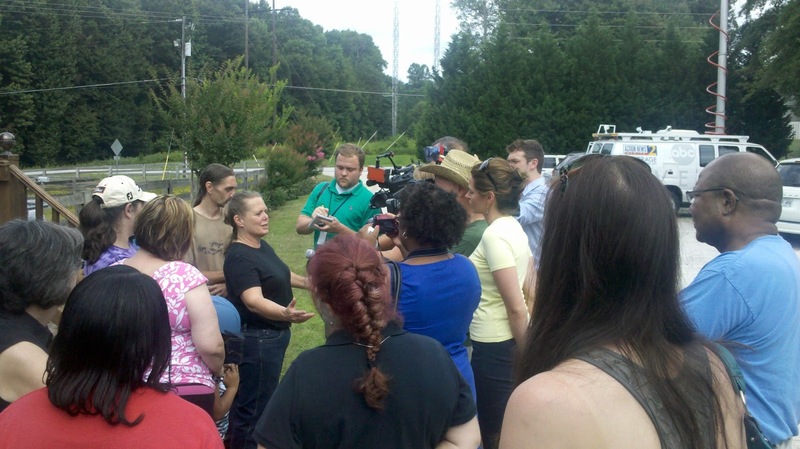 Mr. Trotti was given 24 hours to respond before the campaign to save Jaye's home is escalated. Please sign and share Jaye's petition. 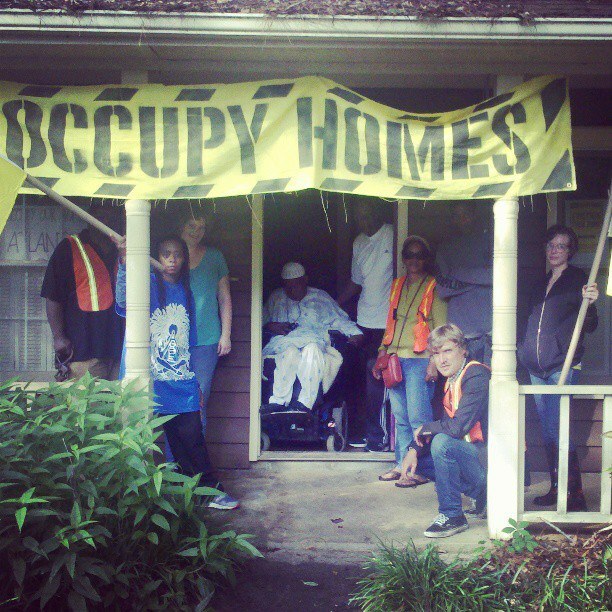 A month ago Toni Furman was evicted from her Lithonia home. Since being evicted she has been fighting and organizing to get back into her home. This past Monday, June 10th, she moved back in and liberated her home with the help of Occupy Our Homes Atlanta. The outpouring of neighborly support has been amazing. After moving in Toni and her community started cleaning up her house and organizing to get Cenlar, the bank that wrongly evicted her last month, to work out a deal that keeps Toni in her home. 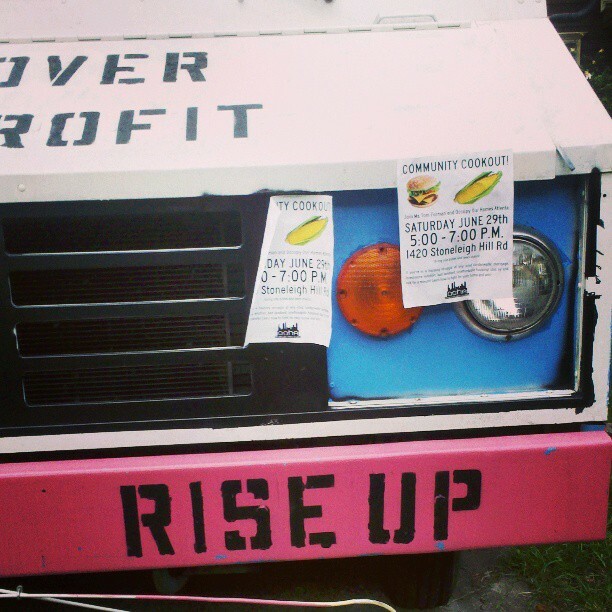 Last night about 50 people cycled through a community cookout hosted at Toni’s house. Neighbors gave words of support and empathy, said they would stand with Toni, and many even shared their own stories of housing struggle. Today neighbors are dropping by the house to call Cenlar CEO Gregory Tornquist on his personal cell phone at (609)-462-0090 and Cenlar VP of Communications Denise Vaccaro at (609)-883-3900 ext. 3292 to demand that Cenlar speak with Toni to work out a deal that keeps her in her home. On Saturday June 15th neighbors and activists will gather at Toni’s home for a community clean up, with residents of the community choosing a site they feel needs some TLC. I find myself at a loss for words. I can only describe the feeling I have in my heart today as a deep gratitude. Because of all your help, I found the strength to fight when I thought it was hopeless. I have never been so personally touched by the effort, dedication, and selflessness exhibited by you...my friends...my family...and those of you which whom I have never even met. I find myself today feeling inspired, armed with knowledge I never knew I needed. It is because of the actions you all showed that I must become involved in helping other victims of these injustices. I guess what I really want to you all to know is simply THANK YOU! In the sincerest form possible. Thank you from the bottom of my heart. In the picture above, me and my very close friend Minoria Franks are holding both my eviction dismissal and a signed document that says I'm a resident in good standing! With your help I have gotten back in my home and all eviction proceedings have been dismissed. Tonight I can sleep safely in the place I've called home for ten years! Please take the time to sign other peoples online petitions by clicking here. "I'm Home! The Chains Are Broken!" Day two for Toni Furman's home liberation and she's still standing strong. Today there was a wave of communtiy support for Toni. Dozens of neighbors stopped by to offer help and stand guard in the yard. Cars drove by and gave supportive honks all day. 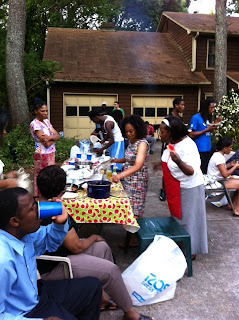 There was so much support that we decided to have a community cookout Tomorrow(6/12) at 6:30 at Toni's house(1420 Stoneliegh Hill Road Lithonia). 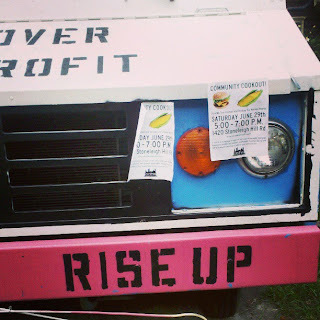 We hope to create space to answer questions the communtiy has about Toni's story, her action, how her story connects with others in the community, ways people can support, and what folks in the community might want to do to improve life in the neighborhood. There was one reminder today that things at Toni's home can change very quickly. 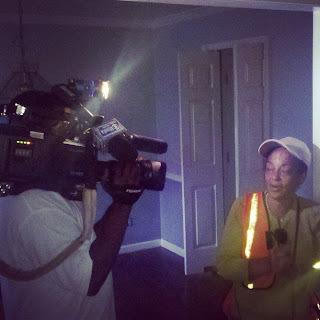 A repair man for Cenlar came by and when he realized that Toni had moved back in he said he was calling the police. The police never came, but is was a reminder that another forced eviction attempt is a real possibility that could happen. Please sign and share Toni's online petition!! Evicted Dekalb Teacher Reclaims Her Home Today! On May 7th of this year, Toni Furman was in her Lithonia home when she heard someone breaking down her door. “They” were the six DeKalb Sheriff’s deputies who evicted her from the home on Stoneleigh Hill Road where she had lived for more than 20 years. Toni hit hard times five years ago when she experienced a difficult divorce. She and her husband had lived in the home for 18 years. The divorce left Toni with the house, nothing more. Toni immediately started to contact Cenlar, a loan servicing company, to see about getting a loan modification with no results. Eventually Toni got an extra job so that she could get closer to affording the mortgage payment. Cenlar continued to refuse to work with Toni. Toni’s home wasn’t any foreclosure , Toni had around 100k in equity, which made for a very attractive foreclosure for Cenlar. In the end Cenlar refused her modification because he ex husband refused to sign modification paperwork, despite the fact that Toni had won the home in a divorce settlement. Because Cenlar refused to work with Toni she became homeless and was staying with a neighbor in her community. Toni is ready to take bold action to reclaim her home despite the consequence. Toni is ready to be a voice for others struggling to simply have a place to call home. 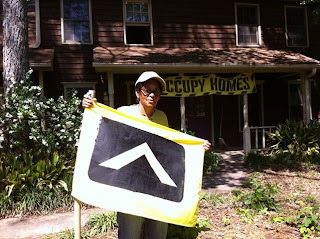 Today at around 6:30pm Toni marched to her home at 1420 Stoneliegh Hill Road, Lithonia, with the support of other Atlanta residents active in Occupy Our Homes Atlanta and reclaimed her home of over 20 years from Cenlar. This was a brave, bold, risky move for Toni, who had never been involved in any social justice movement prior to her crisis. There's no telling how this story is going to end, but we know it's starking lots of conversations in her community and is being covered on several local news outlets. Great article by Crossroads News. Jaye Crawford lives in the Warehouse Lofts on rogers street in the Kirkwood community. She's rented there for close to 15 years and made thousands of dollars in renovations. It's become a living space for Jaye and her young daughter, it's also become the space Jaye runs her personal fitness training business out of. The trouble began a year ago when new neighbors moved in with a barking dog. Unfortunately the poor dog would bark all night making it impossible for Jaye and her daughter to sleep. Eventually, after speaking with the neighbor several times, Jaye made a noise complaint. Despite the fact that the neighbors were fined for their noise violation, the barking continued. Jaye decided to go to the property manager, Hugh Trotti, with the issue. Instead of working with Jaye, Hugh Trotti informed the longtime resident that her lease would not be renewed and that she would need to be out by the end of June. This was devastating news to Jaye as her home is not only an integral part of her work it's also in her daughters charter school district. Rather then packing up and moving Jaye decided to fight back with the help of Occupy Our Homes Atlanta and American Friends Service Committee. Jaye has worked with the community to organize cookouts, candlelight vigils in front of Hugh Trotti's home, and published an online petition to pressure Hugh Trotti to do the right thing. A tenant should never be displace arbitrarily from a home they have been devoted to for years. One of the values that drives AFSC's work is the belief in human dignity, that no human being should be so easily discarded. We encourage everyone to make the following calls/emails and encourage Hugh Trotti not to displace this hard working single mother. 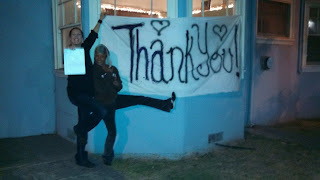 1) She has made thousands of dollars in repairs and improvements to her loft and Mr. Trotti wants to reap the benefits. 2). She recently took a neighbor to court (and WON) over their incessantly barking dog, which keeps Jaye and her daughter up at night. Mr. Trotti has refused to address the constant noise violations, and doesn’t want any tenants that raise issues with the way he runs the Warehouse Lofts. Neither of these are reasons to kick a family out of their stable home. Click her to sign the petition. I’ve been in the Bay area the last few days attending a conference on public banking. I jumped at the opportunity to go because I’m truly interested in learning more about alternative to our current failed banking system, and it was an opportunity to visit my family in Oakland. This afternoon I got a frantic call from my little sister Irene. She was being evicted from the home she had lived in for 10 years. The eviction was a surprise to her and her roommate as she is totally up to date on her payments. Irene and her roommate had trouble paying her rent this past February but since she never missed a payment in her time here and it was only one month, the management agreed to a payment plan. Since then Irene has made all payments and is currently up to date on her rent. I personally have view the receipts and bank statements that confirm her payments. This morning when Irene’s roommate stepped outside he saw a notice tacked on the front door. It was an eviction notice informing them that an eviction would be carried out today. It was the first notice they had received. Irene immediately went to the courthouse filed and paid for a stay(with was granted), and rushed home. When she got home the sheriff had already changed the locks and the property manager wouldn’t let her in the home. She was locked out with no access to her belongings or her two cats. 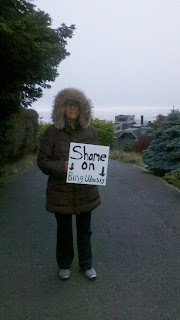 After organizing on online phone/email blast to property manager and owner Bing Udinsky, several of us decided to hold a small candlelight vigil outside Bing’s home. In the early hours of the morning, order of stay and receipt in hand, Irene moved back into her home with the support of her friends and family. Right now she is safe and sound inside her home. Her stay is good till July 5th, we hope law enforcement will comply. At this point we still need a lot of pressure put on the Bing Udinsky and JU Properties. Please call and email call JU property manager Bing Udinsky and demand they let my little sister Irene Franzen back in her home (1618 6th avenue, Oakland Ca). Irene has lived there for 10 years and has made thousands of dollars in improvements. Irene literally has nowhere else to go right now and is totally paid up on her rent. Click here to sign the online petition for Irene. We know that Bing has begun to respond by text and email to folks claiming Irene was several month behind, that she was given notice, and that Bing had given numerous calls to Irene. There’s are all lies that make one of two things clear; 1) Bing Udinsky is purposefully misrepresenting the truth. 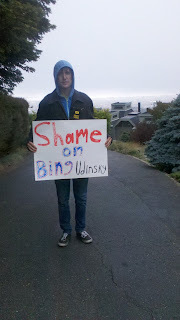 2) Bing Udinsky has made some sort of mistake that has put my sister in jeopardy.